Praising 2,300 new casino jobs overlooks the fact that this area doesn't have 2,300 more casino employees. The casinos are literally going to the ends of the globe now to get help. Foxwoods is the world's biggest gambling complex, with 320,000-sqare feet of gambling space. But when greed goes unchecked, even biggest isn't big enough. Last week the casino's tribal officials announced a massive $700 million expansion that will add two million square feet to the facility. No doubt Mohegan Sun will soon counter with its next expansion plan. 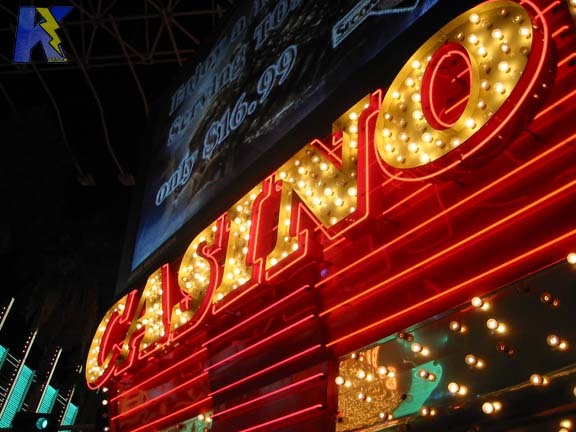 Two things are clear: With each expansion, the casinos increase their economic and political dominance, and the region's economy is becoming increasingly dependent on the gambling industry. Despite far-reaching policy implications these trends will have on labor, business, housing, public education and public health, no one is asking the essential policy question: "Where will it lead?" Mimicking lines fed to them by their financial analysts, both tribes say they're expanding to "capture more market share." That's casino speak for capturing more prospective gamblers. None of this is surprising. Casinos never get smaller. What's surprising is that some spokesmen for business and commerce groups laud casino expansion news as "good." Are they paying attention to the rest of the news flowing from the two casinos these days? Foxwoods announced plans to add nearly 2,000 slot machines the day after Stonington's finance accountant Donna Allen went to prison for stealing from her employer to support her addiction to slots. The flood of slot machines into this region has given rise to a new class of improbable criminals – middle-age women, married with children, gainfully employed, with no criminal history – now residing in taxpayer-funded cells. White collar crime, bankruptcy, property foreclosure, extinguished pension funds, and divorce are hidden costs borne by communities nearest casinos. But the spin on the latest casino expansion cleverly deflects focus from the ugly social costs by pushing "job creation." The Eastern Connecticut Chamber of Commerce and the Connecticut Business and Industry Association (CBIA) have endorsed the Foxwoods expansion. "Anything that can be done to add jobs to the Connecticut economy has to be looked at as a very positive development," a CBIA economist told The Day. When an economist says "anything' is ‘very positive development," it's time to question how low the bar has been set for this region. On a bigger scale, as the state's self-proclaimed largest business organization headquartered in Hartford, has CBIA done any in-depth analysis on the impact that the new 200,000-foot convention center and 825-room hotel at Foxwoods will have on the viability of Adriaen's Landing, a heavily tax-subsidized convention center intended to revitalize Hartford's economy? Chamber president Tony Sheridan insisted: "We have to look at the bigger picture here. People have to have decent jobs, and Foxwoods provides them." I don't know how Sheridan defines big picture and decent. But he'll get vertigo if he looks at the dizzying strains being placed on municipal governments by the casinos. Start with labor. Praising 2,300 new casino jobs overlooks the fact that this area doesn't have 2,300 more casino employees. The casinos are literally going to the ends of the globe now to recruit help. They wouldn't be importing their labor force if this area's labor pool was sufficient. The heavy influx of casino workers is a primary force behind the region's affordable housing shortage. There's a reason condo owners are being cited for illegally converting garage space into bedrooms and bathrooms. Too many new casino employees plus too few rental properties equals budget problems for some area schools. As reported this week, one Norwich school now has 36 percent of its students with a parent employed at the casino, while 25 percent of the students don't speak English as a primary language and 71 percent of the students require free or reduced meals. At so many levels, children pay a bitter price when casinos flourish. While teachers and education officials scrounge to provide essential services, the problem will get worse. One primary source for the casinos' constant need to recruit more workers is the casinos' unusually high turnover rate among employees. Never mind that casino workers are forbidden to unionize; not covered by state or federal labor laws; and that disputes over salary or worker's compensation payments have to be taken to the tribal courts. This only begins to explain job turnover rate. Consider Connecticut's recent legislation to ban smoking in bars and other public workplaces. Correctly, this legislation is premised on the fact that second-hand smoke poses a serious health risk to employees. A recent letter I received from a Mohegan Sun worker sums up how casino employees feel. "As a dealer I feel that the state is treating us like second-class citizens. The law is hypocritical. It was put into effect to protect employees exposed to second-hand smoke. Nowhere is the secondhand smoke worse than at a blackjack table. That [slot revenue] is obviously more important than the health of some 20,000 casino employees." I often hear from casino employees. All want help. None dares go public. Why? "I'm writing to you because I thought you'd be able to mention my concern, the concern of thousands of casino employees when you meet with our legislators," the dealer wrote. "We are afraid to do anything ourselves because we fear repercussions from the tribe." Obviously casinos aren't the only culprits behind the region's transportation, labor, affordable housing and schools funding needs. But they are the elephants in the room. Yet no one dares say this because the casinos are also the 10,000-pound guerillas in Hartford, their political muscles juiced up by $400 million in slot revenues. Powered by slots, the casinos are teaching people to kneel. And I'm not referring to new gambling addicts. I'm taking about those addicted to the proceeds coming from the slots and those too intimidated to speak truth to power. 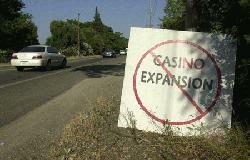 Local officials may not be able to prevent casino expansion. But they need not be so eager to jump on board the endorsement train. Those who do run the risk of sounding like the pilot who told passengers: "The good news is that we're making good time. The bad news is that due to an equipment failure we're not sure we're headed in the right direction." The equipment failure here is a lack of information; we don't know the immediate and long-term price for receiving $400 million a year in slot revenues. Warning: this money not only has strings, it has chains. Before any more industry experts and legislators start bowing to the casinos as the area's economic saviors, we'd be wise to ask a policy question: "Where does it lead?" Jeff Benedict is an investigative journalist and lawyer. He is the author of the book, "Without Reservation," about the evolution of the Foxwoods casino. He lives in East Lyme. "The casinos are teaching people to kneel"...oh, no! 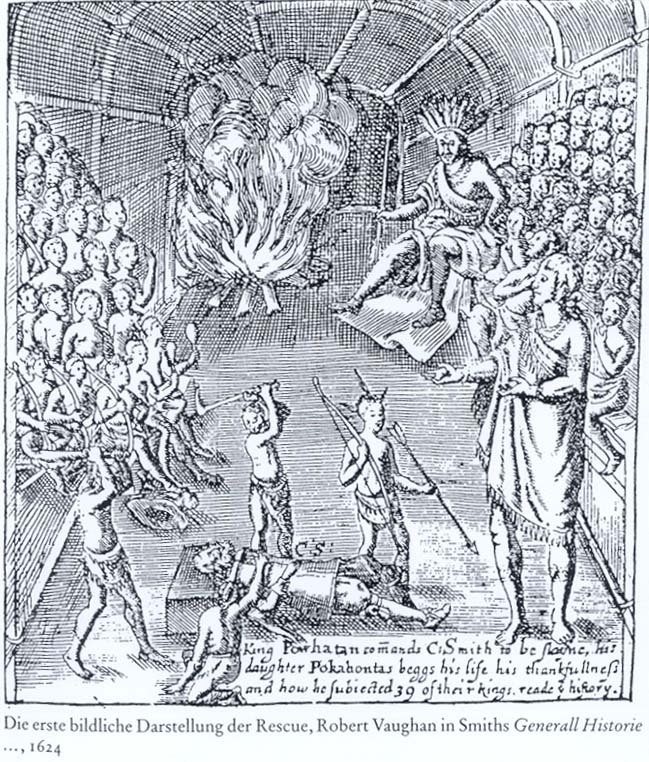 Are those Indians about to chop off poor John Smith's head? Where's Pocahontas when you need her? In other words, the savages are on the warpath and about to overrun the fort. Do something before it's too late! I wonder what Benedict thinks about Wal-Mart's incessant expansion. He seems to be silent on the subject. Indian casinos may be the only business in America criticized for wanting to expand. Far-reaching policy implications that Benedict usually distorts or fabricates. See The Facts about Indian Gaming for details. Not necessarily. A business can increase its market share by attracting its competitors' customers as well as brand-new customers. So Indians are only "mimicking lines"? They aren't intelligent enough to understand the concept of market share on their own? Careful, Benedict, your racism is showing. Huh? Sure they do. 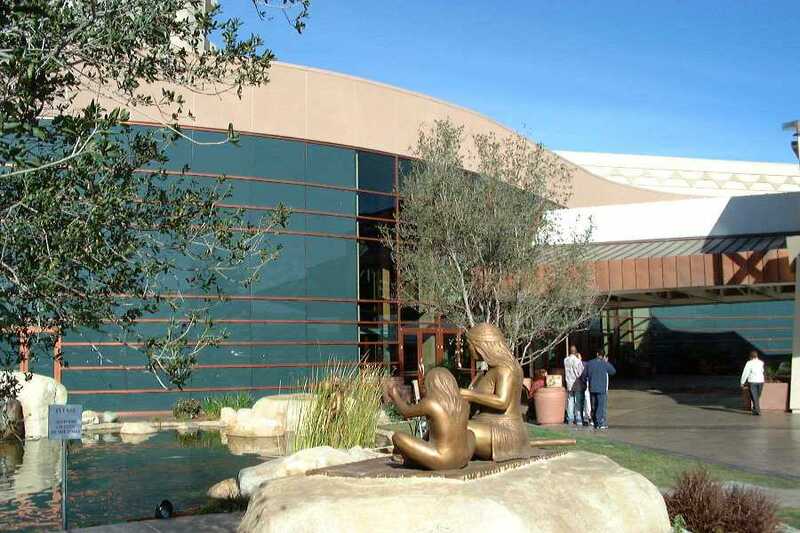 Tribes in California and elsewhere have a long litany of casino closings in their history. And what about the well-known demolition of old casinos in Las Vegas? These properties are gone because they failed to keep up with the competition. If Allen has a gambling problem, she should get treatment. But how would increasing the number of slot machines make her problem worse? Does Benedict think she would've gambled twice as often if there had been twice as many machines. This is specious reasoning. Benedict implies that there's some correlation between the number of slot machines and the amount of problem gambling. But problem gambling occurs in every state, even those without casinos. Again, see The Facts about Indian Gaming. Yes, how clever to discuss a casino's positive effects as well as its negative effects. Too bad Benedict isn't clever enough to use this evenhanded approach. Has Benedict done any in-depth analysis on the impact? Probably not. So southern Connecticut has a 0% unemployment rate? Really? If so, congratulations, but I doubt that's true. Note the vaguely racist tone here. All these brown-skinned people coming to Connecticut...horrors! That leaves less room for all the white-skinned people already there. The casinos wouldn't be increasing their labor force if the residents of southern Connecticut, the casinos' primary customers, weren't impelling them to expand. This is like blaming California's agricultural industry for the migrant workers from Mexico. What's the solution to that problem: cut back on farming? Raise prices, cause food shortages, and thus curb illegal immigration? If 36% percent of the school's students have a parent who works in a casino, but 71% of them require free or reduced meals, then half the problem isn't attributable to casinos. That's true even if every child of a casino worker needs a subsidized meal, which is highly unlikely. In fact, for all we know, the children of casino workers could make up the 29% of students who don't need subsidized meals. This is more likely since, obviously, these students have parents with jobs. I wouldn't believe anything Benedict claims without documentation. Even if it were true, employees could be leaving for perfectly benign reasons. Fast-food restaurants are known for having high turnover, but few people consider them evil sweat shops. "Then don't work there" is the obvious rejoinder. You couldn't tell this from Benedict's frequent screeds. This guy makes a living off bashing Indian casinos, not offering thoughtful critiques of regional problems. On the contrary, the critics of Indian gaming are legion. People like Jeff Benedict, Richard Blumenthal, Brett Fromson, Rep. Christopher Shays, Sen. Christopher Dodd, et al. are all over this issue. It would be daring if any of them said a positive word about Connecticut's casinos, not a negative word. And it's "gorillas," not "guerillas." Translation: Instead of being stepped on by the aforementioned white-skinned people of Connecticut, who stole their land originally, tribes are finally participating in the political process like everyone else. Through Indian gaming, they're finally getting their share of the American pie. "Boo hoo" for the rest of Connecticut's citizens if their piece of the pie is slightly smaller. If they don't like it, they can leave. Their prosperity is built upon broken treaties and stolen land. If they or their ancestors didn't realize that, they should have. As they say, ignorance of the law is no excuse. Indians have hundreds of years of federal law guaranteeing them their unique constitutional rights. What chains? The tribes aren't forcing the state to spend the money in certain ways. The money doesn't even have strings, much less chains. Clearly Benedict can't answer his own question with anything resembling a plausible scenario, so he leaves it hanging. It's a tactic designed to scare people, not enlighten them.